This summer has been going by so fast, and I have found it hard to keep up with the recipes I want to post here. Over the past few months I have grown into a hummus fiend; Costco-sized tubs don’t last long enough, so sometimes I make my own. After experimenting with different flavours of this delicious chickpea dip (plain, paprika, and spinach), I decided to use a different kind of bean. I got the recipe for Pesto White Bean Dip from Let Them Eat Vegan by Dreena Burton. In a food processor, blend everything except for half of the pine nuts. The more olive oil you add, the richer the dip will be, and the more water you add, the thinner it will be. Stir in the rest of the pine nuts and Enjoy! Delicious in sandwiches and with crackers, and a perfect summer recipe. Even though I did not make my own bread the time this bean dip was around, I thought this would be a good place to include the Whole Wheat Bread I made recently. I got the recipe from my employer at Bagelino’s, a bagel shop located in downtown Calgary. He won’t give up his secret homemade bagel recipe, but he was willing to share his bread recipe, and threw in some fresh yeast for me to use at home. When he gave me the recipe, he only included the ingredient measurements, but not much in the line of instructions, so I had to apply some techniques from working with fresh yeast at Cordon Bleu. Combine flour, salt, and butter in a large bowl. In a small bowl, combine sugar and yeast and then add to flour mixture. Add water and combine. I needed to add a little more flour, as the dough was too sticky, and I did this one tsp at a time. I wanted the dough to be slightly sticky, but also slightly smooth. Knead the dough by throwing it on a lightly floured surface over and over again, folding it on itself, for about 10 minutes. Place in a lightly floured bowl and cover with a towel or a plastic bag. Let the dough rest for 45 minutes. Punch down the dough and knead again for about 5 minutes. Shape the dough into a log and place in a lightly greased bread pan. Let rise for another 30 minutes. Bake at 350 degrees for 40 minutes, turning the pan half way through. A good tip that my employer gave me was to put a about an inch of water into an oven-safe cup and let it sit at the bottom of the oven while the bread bakes. This avoids a thick crust from forming. The bread turned out really well; about a third of it was gone before it had time to cool down, thanks to Tom and I snacking on it! 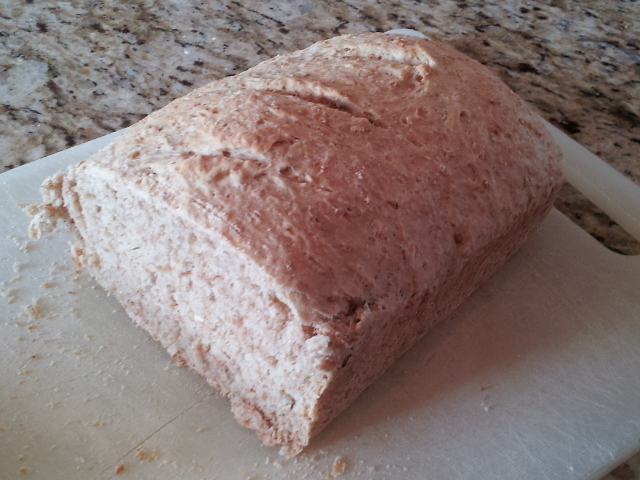 I plan on making more – in fact, I plan on making double batches and freezing the loaves if I have time in the fall. The nice thing about making bread is that the part that takes time is the rising, so if I have a day of studying ahead of me, why not punch some dough during my study breaks?